EDF - sign up and more information Call 09 87 67 37 93 or ask for a free callback, Monday through Friday from 8:30 am to 8 pm & Saturday from 9:30 am to 6 pm, to speak to an English-speaking customer service agent and open an energy account on the EDRF / Enedis in your name. If possible, make sure you have a French IBAN and French phone number ready before the call. EDF is a historical French energy supplier, and the most well-known. With millions of customers in the country, it naturally receives a lot of reviews, both good and bad. Below is a presentation of the main positive and negative aspects frequently brought up by EDF customers, as well as a guide on how to switch to another gas or electricity provider if you feel it might be time to change. In order to make up your mind before subscribing to a contract with EDF, here is a little rundown of the main points about the supplier to be aware about. There are a lot of customer reviews on EDF, which can help get a better understanding of what the energy provider offers and how satisfactory the services are. A long-standing and legitimate provider. Prices are controlled by a French authority, the CRE. An overall satisfactory customer service. Flexibility in regards to unpaid bills. The bills are often overestimated (as is the case for most suppliers, though). The regulated tariff is one of the most expensive on the market. EDF relies in majority on nuclear power, a non-renewable source of energy. If you are currently an EDF customer and wish to leave a review of their services, you can do so by filling our this EDF satisfaction form (in French). There are many reasons why subscribing to EDF for a gas or electricity can be very advantageous. Below is a list of some of the major positive aspects relative to EDF. 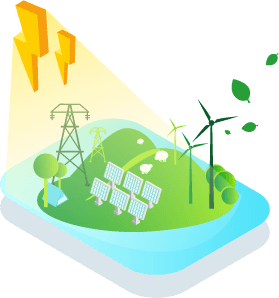 Being a historical provider and the leader on the national energy market, EDF is extremely well-known in France and also the most popular energy supplier. With over 25 millions clients across the country, it is thus a reference and the provider many French people turn to, because they aren’t aware of the other energy suppliers in existence. By choosing EDF, people thus feel they are in good hands, that they are going for a safe and trusted option. Just make sure you are dealing with the real provider - a number of fraudulent companies try to emulate the provider exists, so always double check emails and webistes for potential warning signs, to avoid EDF scams. To add to the provider’s legitimacy, some of the EDF tariffs are overseen by the authorities in France, and they slowly evolve over time, which makes it reassuring and trusted by people. The EDF tarif bleu, which is fixed by a French independent authority called the CRE and acts as a baseline for other providers to adjust their prices to. It is generally speaking one of the most expensive tariffs on the French market. It comes in a flat rate (“Base” option) or the peak/off-peak rate (“heures creuses / heures pleines” options). The EDF tarif EJP or Effacement des Jours de Pointe ("Erasing of peak days"), which offers reduced rates on 343 days a year (but regular, more expensive rates on the remaining 22 days). This offer is still running, but it is no longer accessible to new subscribers. The EDF tarif Tempo, which applies 6 different rates depending on the day of the week / year. Both the Tempo and the EJP tariffs aren’t only offered by EDF, and aren’t that attractive in terms of price or comfort, since they are fairly constraining. A customer moving into a new home can have the Tempo / EJP option changed for free, otherwise it will be charged for. Note that these two last offers, which EDF is the only provider to offer, and quite constraining and aren't that interesting price-wise. The Tarif Bleu generally remains the most attractive of these 3 offers. The EDF Vert Électrique offer, a green and renewable electricity offer, a little more expensive than the Tarif Bleu. The EDF Digiwatt offer, an online-only offer with a % discount compared to the regulated tariffs. Even though it can prove difficult to reach (especially during the months of September and January, and at the beginning of a month), EDF is praised for having a good customer service, and the EDF customer service was even named the nº1 supplier for “customer relations with service companies” by TNS Sofres in 2016. Selectra can help you choose your new energy provider! Just call us at 09 87 67 37 93, or ask for a free callback, to get assistance in choosing which supplier will best meet your needs and budget. Although there are notable positive aspects to starting a contract with EDF, it may be interesting to be aware of some relatively negative aspects too, which are reported by customers. A criticism that is at times brought up about EDF is the lack of clarity in the way their bills work, and the amounts charged which can turn out a lot higher than what has been actually consumed. This is due to the fact that it is very difficult to estimate exactly how much energy a household consumes on a yearly basis, so it can indeed happen that clients are charged more than what is due. But EDF is usually quick to refund the price difference, and if not you should let it be known to the EDF Helpline, which should make sure you get your money back. This said, this issue should disappear in time, as the Linky meter is getting installed in more and more French households and should become the norm in the years to come. These meters collect your energy consumption data automatically, and thus will put and end to overestimations. EDF Relevé ConfianceIf you are an EDF customer, you can put an end to overestimations today by creating your online EDF account on the provider’s website, and report your meter readings yourself directly on the platform. Furthermore, some clients complain about the lack of clarity of the EDF bills, which can appear hard to decipher. But this is actually a more general problem that doesn’t just concern EDF, as a 2014 Ifop-Qinergy study shows that 90% of French people admit to struggling to understand energy bills. Another frequent complaint is that the EDF Customer Service is very difficult to reach due to phone line saturation, especially during peak times of the week (Monday especially) and at certain times of the year, such as during the back to school period in August and September. The downside of the EDF regulated tariffs is that they are among the highest on the market, and moreover the tariff bleu is on the increase. Below is an example of comparison between the prices for the off peak / peak system and the base system, set by EDF and by another provider, Direct Energie. Owning 58 nuclear plants in France, EDF relies heavily on this type of energy - which is alas not a sustainable source of electricity, and moreover does cause some issues related to safety and dangerous nuclear waste management. There are many green energy offers on the French market today, oftentimes with lower rates than EDF. Alterna, Planète Oui, Total Spring, Direct Energie, Enercoop... Just to name a few. Enercoop stands out the most amonst these in France, being the only cooperative in the country to sell electricity which is produced by its members. As a social enterprise, its profits are reinvested into the structure, in order to further develop renewable energy production in France. This said, for customers who are concerned about their budget as well as the environment, we suggest going with either Planète Oui or Direct Energie, as their rates are always lower. Some suppliers, such as Ilek, can even provide you with assistance to help you install self-consumption system at home. If you don’t feel like EDF is the right supplier for your needs, there are a lot of other energy suppliers in France and offers on the market that you can consider instead. Find out how to cancel your current contract and choose another provider below. Cancelling an EDF contract is much simpler than one might think, and only requires a simple phone call. There is no need to inform EDF of your decision, the new provider you choose will do that for you. No need either to touch your meter in any way, plus you won’t have to change your equipment and won’t experience a power cut during the transition, as the electricity you receive will remain the same. You can change energy supplier and go back to the regulated tariffs at any time, and regardless of your provider will keep receiving the same services such as maintenance or meter reading interventions, as these are done by Enedis. If you decide you want to change energy providers, below is a selection of offers from alternate suppliers to EDF, offering cheaper rates and in many cases better customer service. Still unsure which provider and offer to choose? Get in touch with our English speaking advisors who will be able to guide you and set you up with an energy supplier right for your budget and needs. Call us at 09 87 67 37 93, or ask for a free callback.